Shruti has more than 17 years of SUCCESS with strategic planning, design and implementation of Quality Management Systems (QMS) within different industry verticals such as Drugs and Pharmaceuticals, Natural Health Products, OTC and Dietary Supplements, Medical Devices, Biotechnology and Biologics. - Internal audits and Due diligences. - Site design and set up. - Quality management systems (QMS) planning and execution. - Quality- by- design (QBD) implementation from development through commercialization. - Vendor audits, qualification and vendor management. - Supply chain logistics management. - cGMP compliance and regular upgrades. - Operations monitoring and data management. - SOP document creation, maintenance, training and records. - Continuous improvement for efficiency improvement, productivity increase, cost control using LEAN, TQM, Kaizen, Hoshin Kanri, TPM, JIT, ISO etc. - GMP lead for compliance audits by regulatory authorities such as Health Canada, USFDA, Brazil ANVISA, UK MHRA, WHO GMP etc..
- Balanced: Tackles compliance challenges with thorough balance perspective. - Comprehensive: Specialize in guiding clients through all aspects of compliance i.e. From prevention to remediation. - Integrated: Understand each client's unique situation, recommend practical quality concepts and work in tandem with her team. - Deliberate: Have a laser beam focus on quality, Understand how to solve problems. - Straight forward: Though Shruti may not present the lowest bid, every proposal reflects an honest assessment of the time and effort that will be required to successfully resolve an issue. Audits are designed to add value and improve an organization's operations. Shruti's commitment to integrity, accountability, timeliness and objective audit reports have provided value to company's board of directors, CEOs, audit committee members of many quality conscious companies around the globe. Shruti has facilitated several companies to successfully clear cGMP compliance audits. She has expertise with auditors and regulators of over 50 countries such as, Health Canada, USFDA, Europe (MHRA), Australia (TGA), MCC, ANVISA (Brazil), WHO (Geneva), FDA (Netherlands). etc. - Pre-purchase vendor site qualification and capability audit. - Warehouses, Transportation and Distribution channels audit. - Safety testing labs, GLP-Chemicals and Analytical testing laboratory audit. - cGMP- contract manufacturing sites audit. - Gap analysis, OOS, CAPA inspections and follow-up audit. - Machineries audit prior to procurement, Factory acceptance test (FAT), Site acceptance test (SAT). - Clinical research organizations (CROs), hospitals, pathology, microbiology and biochemistry labs. - Chemical reactors site audit for drugs, fine chemicals and foods. - Fermentation reactor site audit for vaccines and biotech. - R&D audits for product development, outsourcing and In-licensing. - Building management systems (BMS) audit. - Electronic document management systems (21 CFR, Part 11 compliance). - SOP and Training records audit. - Identifying ways to prevent product counterfeiting. - Due Diligence prior to Acquisition, Merger, Outsourcing. Shruti has over 17 years of hands-on expertise with facilitating start-ups and growing companies towards building 'Quality' and Quality-by-design (QbD)culture in their organization. - Design and implementation of Corporate Quality Policy. - Prepare site master files (SMF). - Provide on-site support for new product trials, scale-up and validation. - Prepare, revise and maintain SOPs. Monitor IQ, OQ, PQ, DQ documentation and records. - Initiate SOP, cGMP training. Coordinate with internal and/or external training experts. Maintain training calendar and records. - Design and develop employee training modules related to both technical and soft skills (along with corporate HR department). - Create learning products in various formats such as Online classrooms, E books, web- based, whitepapers. podcasts, digital magazines, videos. - Lead training and business improvement programs. Outcome: Reduced costs by 17%, development timelines by 35%, cycle times by 22% and improved productivity phenomenally by 250%. - Training expertise within different industry verticals- drugs and pharmaceuticals, natural health products, medical devices, biotechnology etc. Shruti is hands-on with leading compliance audit and regulatory guidance for more than 50 countries including Canada, USA, European union, Brazil, CIS, Gulf, African countries, India and SE Asia, Australia etc. Shruti specializes in successful implementation of ICH, WHO-GMP, Health Canada, MHRA and 21 CFR guidelines to new product development, manufacturing, packaging, testing, logistics and ware housing of drugs, finished pharmaceuticals, natural health products, biologics, medical devices and OTC products. 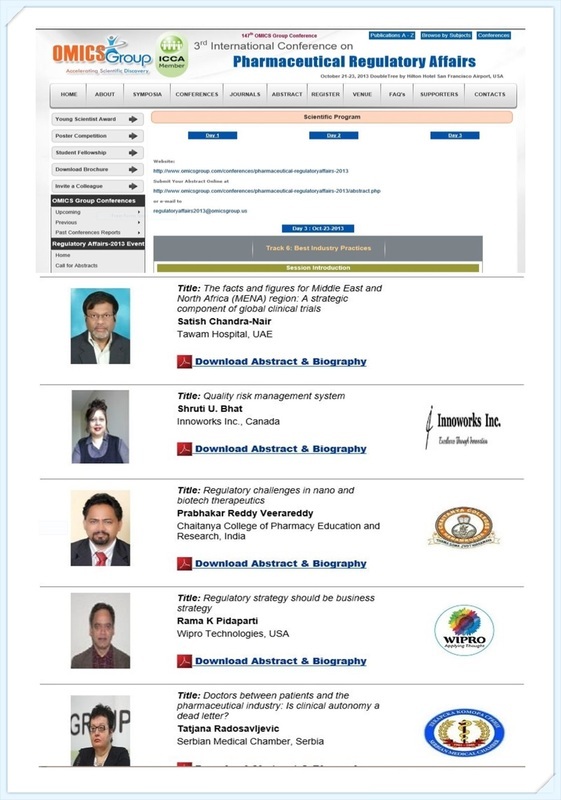 Shruti's scientific paper on "Quality Risk Management Systems" was accepted at the 3rd "International Quality And Regulatory Conference", San Francisco, USA, October 21- 23, 2013. Myth : An expensive tool ! Fact : A tool that makes business processes, operations simple ! Actually saves money and builds company/ brand image ! 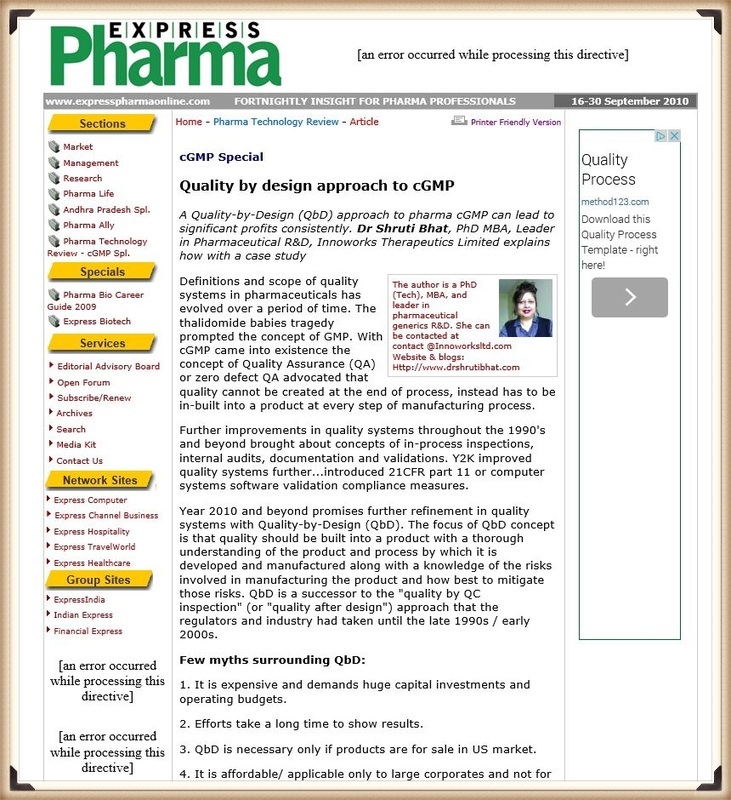 Quality by Design approach to cGMP authored by Dr. Shruti U Bhat was published in BRIC's prime industry magazine 'Express Pharma'. Click here for full article.